The formal elegance of this work arrests the eye sufficiently with its beauty alone. But there is more to it than meets the eye. Soichi Watanabe (b. 1949) uses a spare palette of delicate blues and greens working with light earth tones to gratify not only our desire for visual harmony, but also to create columns of shifting meaning out of his painterly contemplation of the humble bamboo, a plant native to his homeland, Japan. His semi-abstract style is his strength in both welcoming us into the hospitality of his work as well as our pondering its depths. We are invited to a participation that is not spelled out for us but that desires our involvement. We can move around in the environment of this work and see significance without being simply subjective, much as one can do in many of the semi-abstract works of the Swiss/German artist, Paul Klee (1879 -1940). And, as we find so often with Klee’s work, the artist gives the viewer gentle guidance to enter his creation via an evocative title. In this case: The Bamboo-Emptiness-Flexibility- and- The Holy Spirit. The verticality of the composition is punctuated and balanced by three thicker, erect jointed bamboo stems while on the left and right more slender stems bend to and fro crisscrossing the entire surface of the work. Intermingled are fluttering forms suggesting both leaves and shoots. Each segment of this artwork seems to be the seed for the structure for all of the rest. The three unshakable pillars and the many moving parts collide and yet unite, hinting at a Trinitarian understanding of this movement. Once inside this beautiful work insights abound. One senses the wind blowing as the stems bend and the leaves rise and fall. While the stalk of the bamboo is seemingly hollow and might be considered weak, it is full of energy. Wind wafts externally while air rises within it. Bamboo grows quickly and flourishes on a wide range of soil worldwide. It proliferates, astoundingly even up to 2.5 cm overnight. It can create habitat very much like the example Jesus gave of the mustard seed. Due to its fast growing nature it can also, like the mustard plant, take over terrain making it formidable to cope with. The shoots in some species are tender and delectable for eating. Still bamboo is hearty and can thrive in tough conditions. Monsoons and earthquakes have a hard time taking it out. It is strong and flexible. Its versatility is amazing: fabricating structures and scaffolding for building, furniture to rest on, canes for the infirm, fishing poles for commerce and enjoyment, musical instruments for pleasure, utensils, especially for food, for serviceability and much more. Its hollowed stalks can be filled to impart its distinctive savour as well, soothing both body and soul. One of its great connoisseurs, of course, is the giant panda! With Watanabe’s work we have a contemporary interpretation of Jesus’ parable of the mustard seed that many around the world who have not seen a mustard plant flourish can understand. The artist unites this intuition with an understanding of the Holy Spirit who weaves and wafts to give strength and growth within and outside of us. Our small sprouts of life and thought have massive potential to take root like the bamboo. It is not without significance that in the Gospels of Matthew and Luke the parable of the mustard seed is followed by the brief, but compelling parable of the leaven. The woman in this parable adds a tad of yeast to her flour the day before, but by the next day it expands plentifully. The minute can become the mighty! The kingdom of heaven comes to earth by the smallest and humblest of signs and means. Soichi Watanabe reads the Word of God’s World, even as he helps us to read the World of God’s Word. 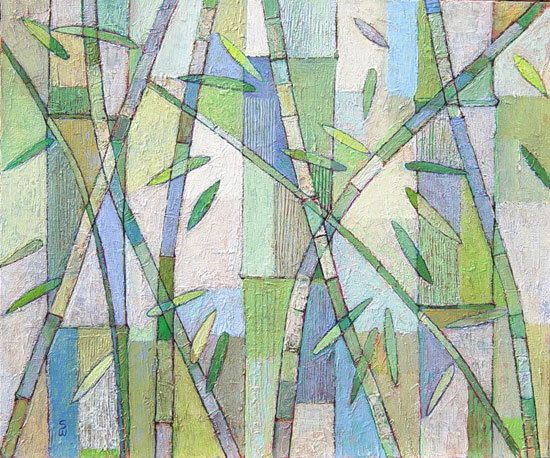 Soichi Watanabe: The Bamboo-Emptiness-Flexibility-and-The Holy Spirit, 2008,(oil on canvas, 45.72 x 38.1 cm/18x 15 inches)is currently part of the traveling art exhibition entitled Charis: Boundary Crossings – Neighbours Strangers Family Friends. For more information on the Charis exhibit see: http://www.calvin.edu/nagel/projects/charis/ as well as http://imagejournal.org/page/journal/back-issues/issue-65. After the exhibit it will be available for purchase for US$ 5,000. Jonathan Bonk, Theo Sundermeier, Soichi Watanabe: For the Least of These: The Art of Soichi Watanabe, OMSC Publications – New Haven, 2010. Soichi Watanabe: Jesus Walking with Us - Soichi Watanabe Plastic of Prayer / Tomoni ayumu Kirisuto - Watanabe Soichi Inori no zoukei, Shinkyo Shupanshya, 2004.